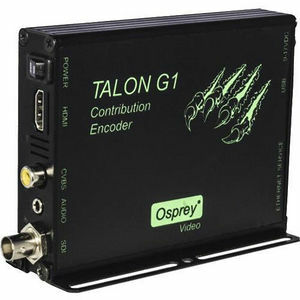 Osprey Talon G2, G1 and G1H hardware-based streaming contribution encoders are designed for A/V and broadcast customers looking for end-to- end video-streaming tools. The Talon series ingests video from multiple formats, encodes it to H.264, and delivers it over IP. Capable of ingesting video via 3G-SDI, HDMI, or Analog Composite, Talon series encode up to three streams simultaneously, with frame alignment across all streams for multiple-bit-rate RTMP streaming. Encode configurations are independent (unless frame aligned) allowing users to create up to three separate encodes, i.e. one RTMP stream, one UDP stream and a separate archive saved as .ts file. A simple, Web-based interface gives users quick access to encoding settings for easy configuration. Talon's small form factor, low power consumption and silent, fanless operation mean users can effectively set it and forget it. Depending on the model chosen, additional features such as LCD information screen and One-Touch Start are available.